We first met Chad Shelton about 3 years ago when he was still in truck driving school in Indianapolis, IN. Fast forward to 3 years later and Chad has spent some time driving dedicated HazMat before progressing to a PAM Transport Driver Mentor position which he's held for about 2 years. In fact, he is currently training his 49th student this week! We had the chance to catch up with Chad near the Driver Solutions office while having some scheduled maintenance done on his truck. He told us that all is going well with PAM Transport after 3 years and he's on track to have his best year yet in 2013. Chad said the biggest thing to tell newbies is that things are going to take time. Don't expect to start off with the best loads making the best money, but after you "pay your dues" things start to fall into place. Chad enjoys his role as a Driver Mentor and looks forward to helping each new student upgrade to a "first seat" driver with the company. In fact, he still stays in touch with many of the drivers he has trained over the years as they turn to him to help answer questions that might come up on the road. He said a big part of success as a truck driver is getting your routine established. With some of the changes to the number of hours truck drivers can work and mandatory breaks, Chad says it's a matter of not overreacting and planning accordingly. As for the future, Chad plans to stay with the company for awhile. He told us he has a good thing going now and has no complaints with PAM Transport after 3 years. We've followed Chad's progress since he was a student back in 2010 and it has been awesome to see him go from student to driver to teacher. We wish him continued success in his truck driving career! A company sponsored CDL training program like the one Driver Solutions offers will help truck drivers get the experience needed to find a trucking job with no upfront tuition cost. Reputable truck driving companies such as PAM Transport are currently hiring drivers with no experience and CDL training is provided. This is the best way for new drivers to get started, gain some valuable experience driving OTR and open doors to a promising trucking career. Complete the no obligation application online to schedule a time to speak with a Driver Agent about truck driving job opportunities that are currently available. 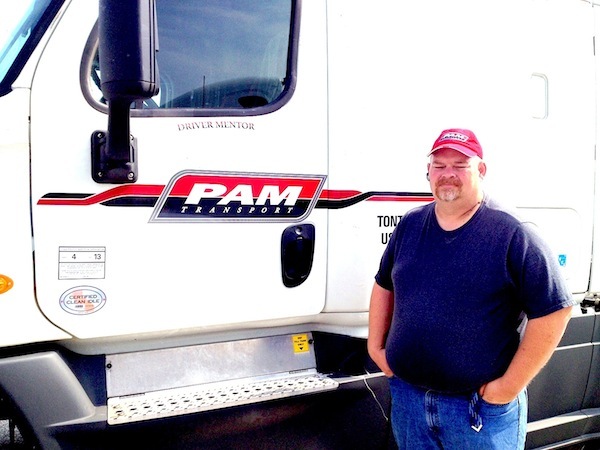 PAM Transport Driver Gives Trucking A Big Thumbs Up After 1st Year!